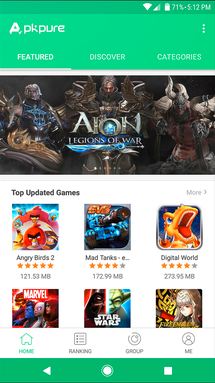 Install any free Android game .apk or .xapk files with a single click, and it will forever stay up to date. As soon as APKPure is installed, you're ready to go. - Redesign the Home page. - Add "Game Sorting" (by Newest and Best) and "Recommend Game" function in Pre-register page. - Add "Notification" in Messages. - Add "Developer Badge" and its explanation. - Add "Excellent" filter in App Posts. - Add "Star Rating" filter in App Reviews. - Special thanks to "Hindun Umi Zenn, Neneppy"who help us translate APKPure to Ukrainian and Japanese. Started by ★H¡мαиsнυSα¡и¡™★ « 1 2 » Help Needed? Post Here!